Living in America is GREAT. On this America’s birthday let’s look at some interesting words someone wrote entitled, "Only in America." 1- Only in America can a pizza get to your house faster than an ambulance. 2- Only in America are there handicap parking places in front of a skating rink. 3- Only in America do drugstores make the sick walk all the way to the back of the store to get their prescriptions, while healthy people can buy cigarettes at the front. 4- Only in America do people order double cheeseburgers, large fries and a DIET coke. 5- Only in America do we leave cars worth thousands of dollars in the driveway and put our junk in the garage. Guilty of that. 6- Only in America do we use answering machines to screen calls and have call waiting so we won’t miss a call from someone we didn’t want to talk to in the first place. 7- Only in America do we buy hot dogs in packages of ten and buns in packages of eight. As we celebrate the greatness of America there are many things that are sad and need to be fixed. Check out the words of George Carlin in which he titled, "Paradox of Our Time." - The paradox of our time in history is that we have taller buildings but shorter tempers, wider freeways, but narrower viewpoints. - We spend more, but have less. We buy more, but enjoy less. - We have bigger houses and smaller families, more conveniences, but less time. - We have more degrees but less sense, more knowledge, but less judgment, more experts, yet more problems, more medicine, but less wellness. - We drink too much, smoke too much, spend too recklessly, laugh too little, drive too fast, get too angry, stay up too late, get up too tired, read too little, watch TV too much, and pray too seldom. - We have multiplied our possessions, but reduced our values. - We talk too much, love too seldom, and hate too often. - We’ve learned how to make a living, but not a life. We’ve added years to life not life to years! - We’ve been all the way to the moon and back, but have trouble crossing the street to meet a new neighbor. - We’ve done larger things, but not better things. - We’ve cleaned up the air, but polluted the soul. - We’ve conquered the atom, but not our prejudice. - We write more, but learn less. - We plan more, but accomplish less. - We’ve learned to rush, but not to wait. - We build more computers to hold more information, to produce more copies than ever, but we communicate less and less. Even though there are a lot of negative things about America I still believe that America is the greatest country in the world. 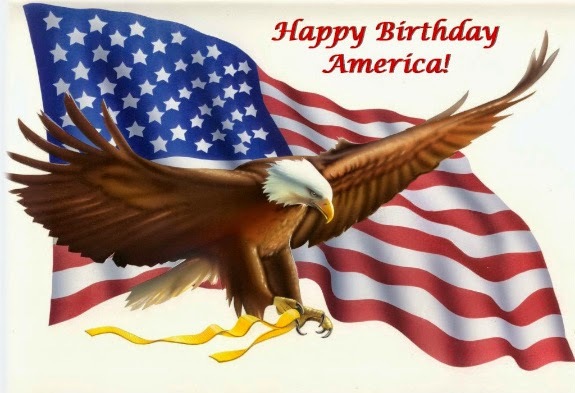 We are blessed to have been born and raised in America. We keep asking God to bless America. He already has. Now it’s our turn to bless America. God has and still is blessing America. But we need to do our part to bless America! We can do many good things. We can be good citizens, vote, be patriotic, salute the flag, sing the national anthem, show courtesy to all people and especially, the elderly, obey the laws, pay our taxes, respect the law and its leaders. But on this the birthday of our nation the biggest thing we can and should do is pray. Pray for our leaders at every level that they will get on their knees and seek God’s face so that they make decisions that would be pleasing to God. Dear Lord, we thank You for this great nation. We thank You for the founding fathers that let You be the foundation. We pray that once again we would turn our country back to You. In Jesus’ Name, Amen.